San Leandro-based Drake’s Brewing Company is the latest Bay Area establishment to expand its footprint to the Sacramento region. Occupying one of the area’s most intriguing pieces of architecture, The Barn in West Sacramento, Drake’s has created the ultimate communal backyard, with picnic tables, fire pits, outdoor games and an expansive lawn where kids and adults can toss around a football on a crisp afternoon or kick their feet up while listening to live music. The 400-seat beer garden at Drake’s Barn offers more than two dozen types of suds on tap plus a smartly curated selection of wine and cocktails. 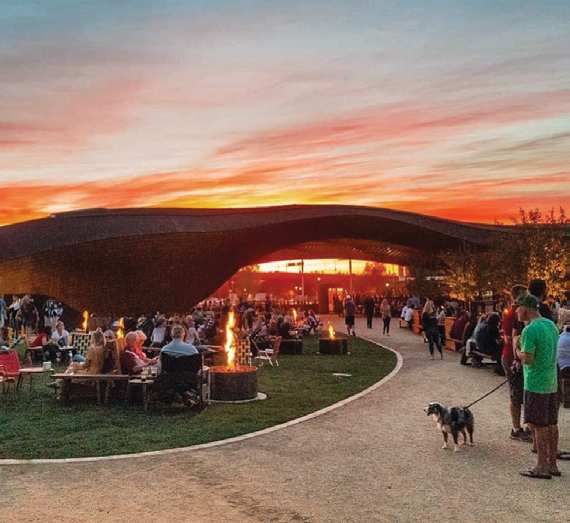 In addition, a craft cocktail bar is slated to open this winter at one end of the shingled pavilion—a first for this beer-centric enterprise. At the other end of the peanut-shaped structure sits PizzaSmith, which Drake’s launched in October. Like the wildly popular Drake’s Dealership in downtown Oakland, PizzaSmith serves up small bites, salads and wood-fired pizzas. Toppings include the usual suspects plus a few surprises—think pickled pineapple with spicy sausage, jalapeño and Sriracha, or Mission figs with crumbled goat cheese and Castelvetrano olives. On most weekends, Drake’s operates a food truck on the site featuring tri-tip sandwiches with assorted accompaniments. One version, the Scorcher, is a fiery beast topped with Hatch chili cheese, jalapeño poppers, Fresno chili sauce and hot banana peppers. “I wanted to create somewhere where you don’t feel you have to go into the restaurant and sit for a meal for two hours,” says Drake’s co-owner John Martin. “The way we have it set up, you might start out in one area to eat, then move over to another area to have a drink or sit around the fire.” Martin says that the “migrating furniture” scattered throughout the site was meant to encourage that sort of organic movement—and to allow patrons to relocate to the shade or sun as they wish.